Cocaine Anonymous is not organized in the formal or political sense, There are no governing officers, no rules or regulations, no dues or fees. However, the need for services to addicts throughout the world is very important to the Fellowship. Inquiries from both within and outside the Fellowship have to be answered. Literature has to be written, printed and distributed, and requests for help be followed up. The main service body of the Fellowship is C.A. World Services, which is centered at the World Service Office in Los Angeles, California, where employees and service volunteers maintain communications with local Groups and with persons outside the Fellowship who turn to C.A. for information on the program of recovery. C.A. Conference-approved Literature and chips are prepared, published and distributed through this office. The World Service Office, through its Board of Directors, is responsible to the World Service Board of Trustees. The Trustees, who serve as custodians of the Traditions of Cocaine Anonymous as well as interpreters of policies affecting C.A. as a whole, in turn are responsible to the World Service Conference. The World Service Office is responsible to the World Service Board of Trustees. The C.A. World Service Conference, consisting of Delegates from C.A. Areas throughout the Fellowship, Trustees of C.A. World Services, and World Service Office Directors and staff members, meet annually, and provide a link between the Groups within the Fellowship and the Trustees who serve as custodians of C.A .Traditions and interpreters of policies affecting the Fellowship as a whole. The principal of consistent rotation of responsibility is followed by all C.A. service positions. The spirit of rotation is a vital principle within our service structure which allows for non successive terms on all service positions. This enables more members to experience the true nature of service. Positions in the Service Structure are rotated according to a vote of the Service Structure. 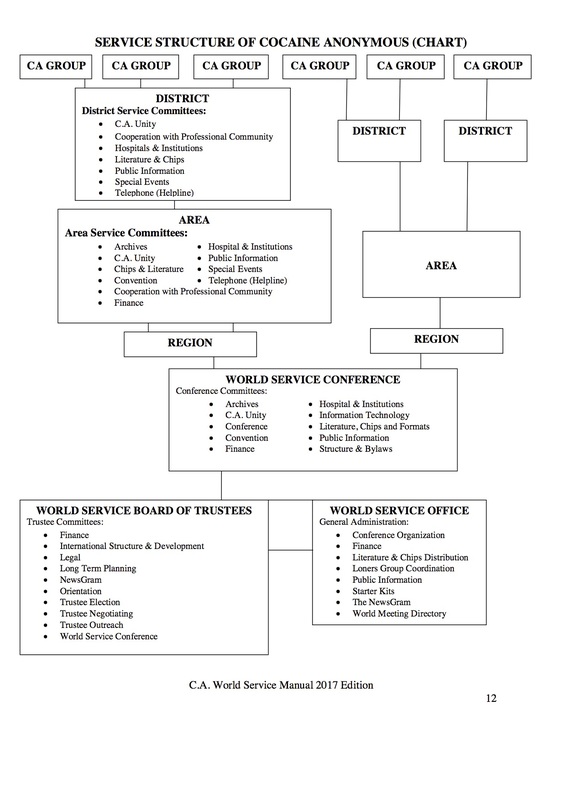 Representatives to the local service organization are voted on at the Service Structure level according to a schedule defined by each Service Structure. Officers of the service organization are elected based on the group conscience of that organization. Formal organization is kept to a minimum at the local Group level. The Group may have a limited number of “officers” whose responsibilities include, but are not limited to, arranging meetings, providing refreshments, handling the Group’s budget, and maintaining contact with the local service organization.